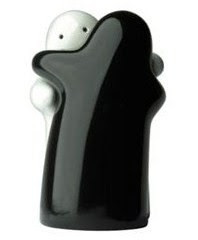 Why do salt and pepper shakers come in such interesting and fun designs? The minimal restrictions and instant recognizability make them an extremely versatile design medium. They are universally recognized as pair of matching containers with holes, and one can simply apply a couple of distinguishing characteristic and—Voilà! 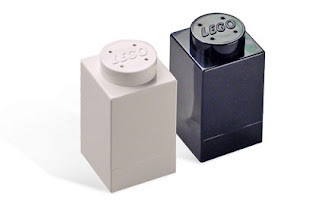 Black and white is a common theme for obvious reasons—salt is a white crystal while crushed pepper is a grainy mix of black and brown. Sometimes red, which is often associated with spice, is used instead of black. 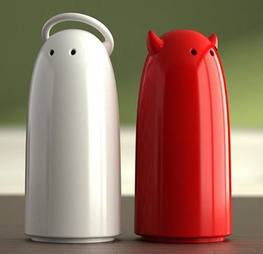 The good and evil shakers below are a conceptually clever pair that uses minimal characteristics to communicate contrasting concepts. What else out there comes in duets? Why, the two hemispheres of the brain, of course! I must admit, whenever someone asks me to name a pair of something, what comes to mind is usually not the two halves of a brain. Interesting concept? Yes. Creepy for the dinner table? A little—depending on your guests and their tolerance for the macabre, of course. I love the design of Hug. 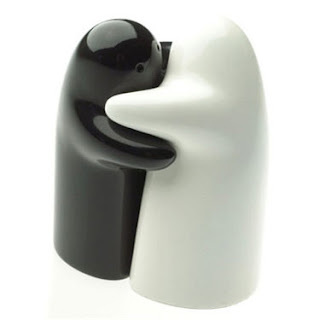 Unlike many salt and pepper shakers, it not only effectively contrasts between the two holders, but also combines them into one unified piece. Plus, the positive theme makes me really happy. 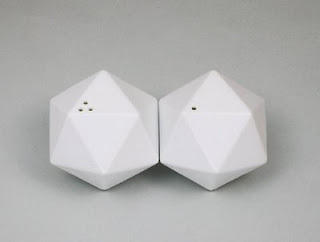 Icosa is inspired by the icosahedron, and the only distinction between the salt and the pepper is the number of holes. I have had a couple of disagreements with friends as to which condiment belongs to the shaker with more holes. A quick search on Google yielded this helpful site, which states that either can be correct. Personally, I like having salt in the shaker with less holes because salt pours out faster and more evenly than pepper does. More holes for the pepper means the two can be shaken at approximately the same rate and yield similar flow rates. 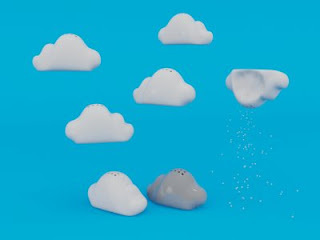 However, some argue the other way around because more people prefer the taste of salt and would apply more to their food than they would pepper. Which way do you swing? Even flow or more salt? Okay, so technically mills are not the same thing as shakers, but these are so much fun that I had to include them here! 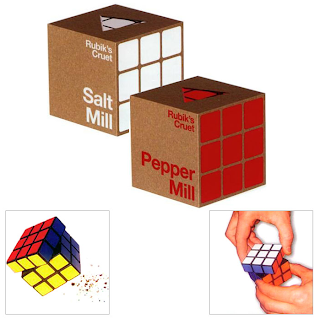 The farthest I have ever gotten with a Rubik's Cube is one side, so for people like me, it's a good thing you don't need to solve them in order to sprinkle some salt and pepper onto your food! These do-it-yourself shakers are such a creative idea! 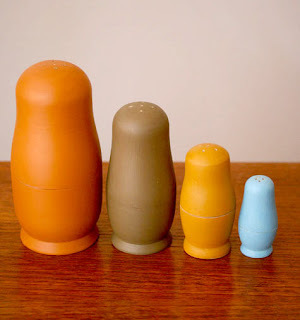 They are made from blank Matryoshka nesting dolls. 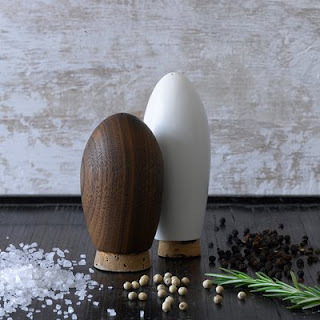 These are wonderfully versatile because you can put more than just salt and pepper—you simply need to drill holes however large you need them to be. Full directions for this fun and crafty idea at Design*Sponge. At our dinner table, we use one set of shakers but own another set of mills. Which do you prefer? Or do you prefer spice blocks instead? I've never owned one before, and would love to hear what it's like! 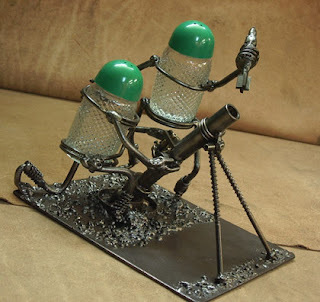 Links to other cool salt and pepper shakers welcome in the comments section.